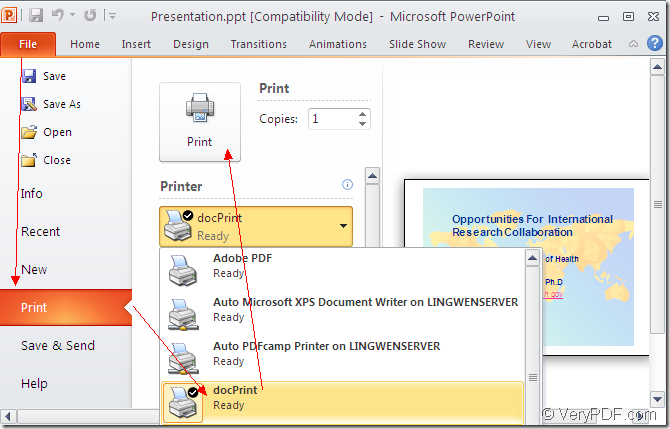 ← How to convert documents of Microsoft Office PowerPoint to AVS? How to convert documents of Microsoft Office PowerPoint to JBG? With the help of docPrint Document Converter Professional, you can convert ppt to jbg in no more than three steps. You should get the acquaintance to docPrint Document Converter Professional first. There are three applications in docPrint Document Converter Professional—GUI application, command line application and virtual printer application. GUI application is always used to do batch conversion. The command line application is taken by software developers and the virtual printer can also act as a document converter. In this article, you will see how to convert ppt to jbg with the virtual printer—docPrint. To use docPrint, you should download docPrint Document Converter Professional (docPrint Pro) at http://www.verypdf.com/artprint/docprint_pro_setup.exe. After installing it on your computer, you can see docPrint in the printer list by clicking “Start”—“Printers and Faxes”. If you want to set docPrint as the default printer, you can right click docPrint and choose “Set as default printer” option. The following contents will give a specific interpretation to convert ppt to jbg. You should run the printer driver first. If docPrint is not the printer driver, please open the PPT document and click “File”—“Print” to open “Print” dialog box in which you can set docPrint as current printer. Then click “Print” button. Please see Figure1. The hot key “Ctrl”+ “P” can also open this dialog box. 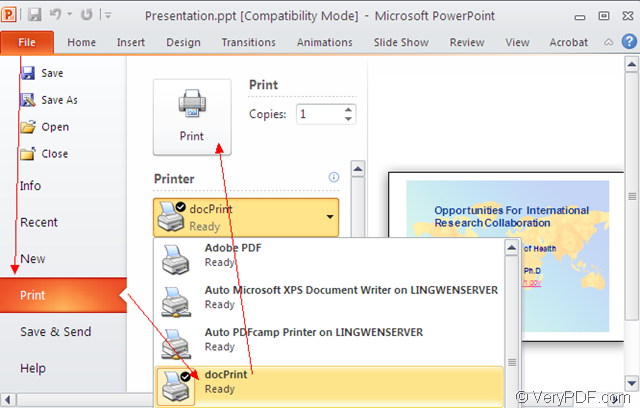 If docPrint is the default printer, you can directly run docPrint by right clicking on the icon of PPT document and choosing “Print” option. Then you will see “docPrint” dialog box instantly. Please see Figure2. 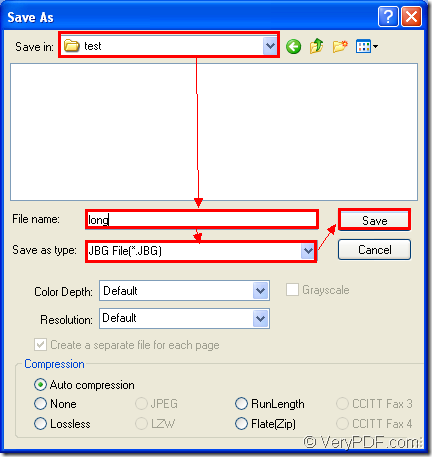 In this dialog box, you should use the ways given below to open “Save As” dialog box. The first way is to click “File” and click “Save as” in dropdown list. The second way is to click the icon which seems like a floppy disk in the toolbar. The third one is to use the hot key “Ctrl”+ “S” combination. After getting the “Save As” dialog box showed in Figure3, you should make the following operations. Firstly, please specify the location for output files in “Save in” combo box. Secondly, input the name of target file in “File name” edit box. Thirdly, in “Save as type” combo box, you should choose the right output format. Then click “Save” button. It is easy enough to convert ppt to jbg and you can do it very well according to the steps above. 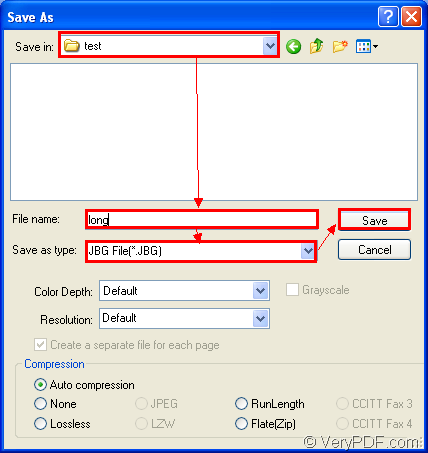 To browse the target files in specified location means the end of the conversion. To learn more functions of docPrint Pro, you’d better download the software and try it yourself. How to convert MS Office Excel documents of XLS to GIF? This entry was posted in docPrint Pro and tagged docPrint Pro, ppt to jbg. Bookmark the permalink.